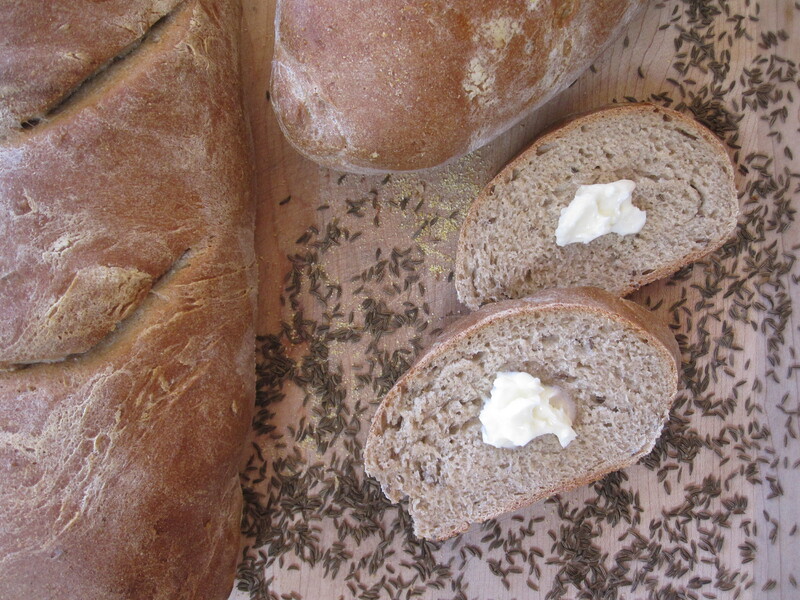 This bread is perfect for sandwiches or to serve alongside soup, such as Irish Watercress Soup. Find a link to this post and a number of other yummy baked goods at Yeastspotting! Dissolve yeast and honey in warm water in the bowl of the mixer. Mix in the flour. Beat until mixture is smooth. Cover and allow to sit for 2 1/2 hours. Sponge should be very bubbly when you return. Add the all purpose flour, 3 1/4 cups rye flour, toasted caraway seeds, vegetable oil, salt, and onion (if using) to the sponge. Knead with a dough hook until the dough is thoroughly mixed and gathers into a ball. Add the last 1/4 cup of rye flour, knead for two more minutes. Remove from the mixer and knead for a few minutes by hand on a well floured board until the dough forms a smooth, elastic ball. Place dough ball in an oiled bowl. Flip the dough ball so that the top of the dough is coated with oil as well. Cover bowl and place in a warm place. Let dough rise until doubled, about 1 1/4 to 2 hours. Divide dough into 2 even portions. Press one dough ball into an 9 x 7 inch rectangle. Roll along the long side to form a log. Pinch off the seam to seal. Place on a baking sheet sprinkled with cornmeal, seam down. Repeat with the other portion of dough. Cover loosely with a floured towel or plastic wrap. Allow to rise 1 to 1/2 hours until dough looks bloated and starts to spread. Half an hour before you plan to bake, preheat oven to 425 degrees. Beat egg white with 1 tablespoon milk. Brush over the top of the loaves. 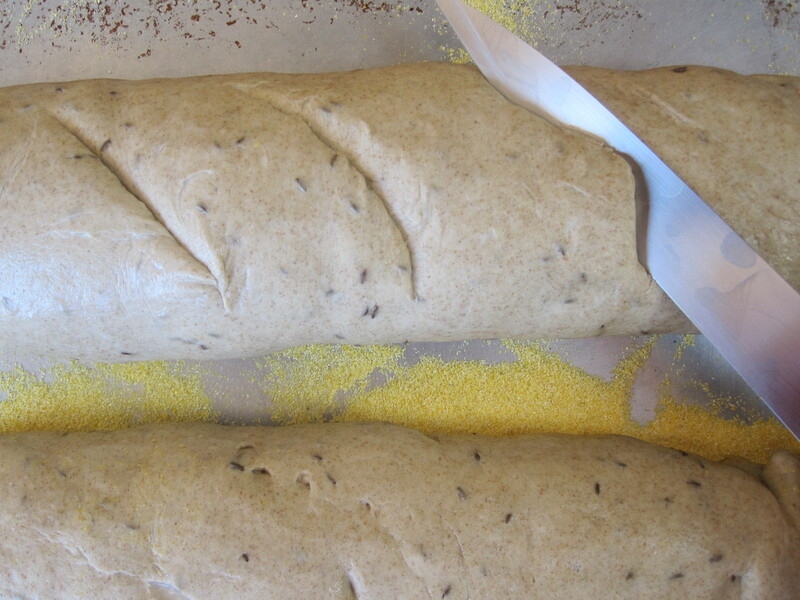 Make several 1/2 inch slashes into the tops of the loaves to allow for further rising in the oven. Bake loaves in the center of the oven for 15 minutes, then reduce the temperature to 400 degrees. Bake until top is nicely browned, about 15-20 additional minutes. Place loaves on a cooling rack and allow to cool. Slice and serve. Store any leftover bread in a tightly sealed bag on counter or in the freezer. Nicely done! It looks fabulous. Yay! I was wondering when you’d find the perfect rye bread recipe so I didn’t have to. ;) Thanks Karen. Did you make the butter too? Funny you should ask, no I did not, but it is on my list of things to do this month! Ok, I’m going to try rye this way. 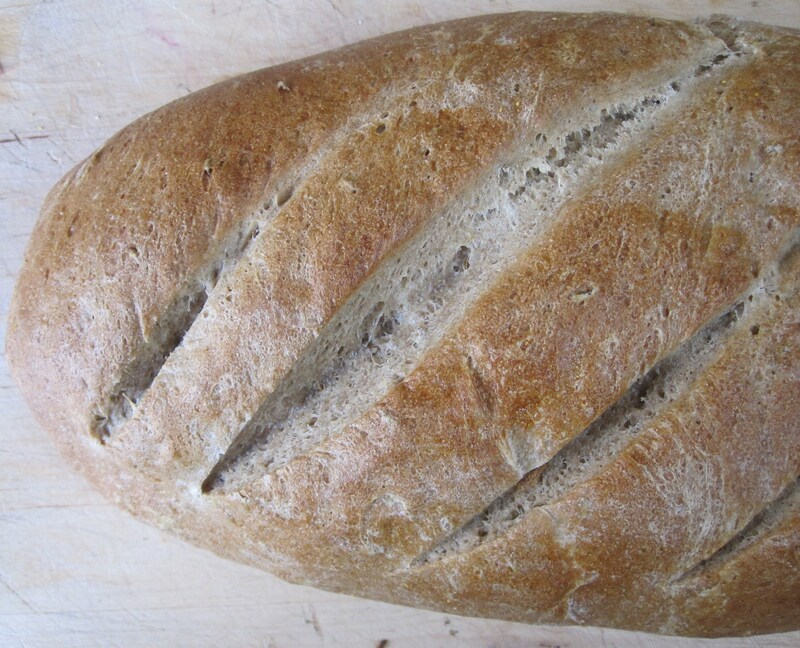 I have been doing the 5/min-day way for rye as well…and it is really good. But I’m ready to branch out. And, as you read, the sourdough isn’t working out so great for me. I’m not sure why I am so reluctant to try something with multiple stages/rise times…but, well, there you have it…I’m stubborn I guess. Give it a try, the multiple rises doesn’t actually mean any more work. I just make it when I am around the house anyway. The recipe works well, I made another batch yesterday and it turned out even better than the first! What a gorgeous loaf of rye! I’m printing this as soon as I’m done typing. I’ve been on a bread baking binge (I’m a proud parent of my new sourdough starter) and I’ve had rye bread on my list to make. It’s been fun to learn about all the flours (I didn’t realize rye is low in gluten, so when I randomly tossed some in to a loaf it turned out very flat – not enough high gluten flour to balance it out). Thank you for sharing this recipe. I’ll bet you enjoyed some delicious sandwiches!